Trump says Mueller investigation was "illegal" and "an attempted coup"
President Trump congratulated Israeli Prime Minister Bibi Netanyahu on his apparent victory and blasted special counsel Robert Mueller's investigation as "illegal" Wednesday before leaving to meet with supporters in Texas. Netanyahu is expected to be indicted on corruption charges soon. "He's been a great ally and he's a friend, I'd like to congratulate him, that was a well-thought out race I can tell you," Mr. Trump said of Netanyahu Wednesday, speaking to reporters on the White House South Lawn. The president arrived in San Antonio early Wednesday afternoon, and many of his events are closed to the press. The president also blasted Mueller's investigation, calling it "illegal" even though he also claims it exonerates him. "It was an illegal investigation," the president told CBS News' chief Washington correspondent Major Garrett. "Major, it was an illegal investigation. It was started illegally. Everything about it was crooked -- every single thing about it. There were dirty cops. These were bad people. If you look at McCabe and Comey, and you look at Lisa and Peter Strzok, these were bad people. And this was a -- an attempted coup. This was an attempted takedown of a president. And we beat them. We beat them." Mr. Trump is in Texas as his administration is looking to implement even more aggressive immigration policies after replacing top leaders at the Department of Homeland Security (DHS). The president is attending a fundraiser in San Antonio, address the International Union of Operating Engineers Training and Education Center in Crosby, and another fundraiser in Houston. The administration is considering changing a handful of key immigration-related policies, even as the president continues his threats to shut down the border. The new policies include changing rules to allow the government to detain migrant families for longer than the current 20-day limit imposed by what's known as the Flores agreement. Mr. Trump told reporters Tuesday that he isn't looking to reinstate the practice of separating children from their parents at the border. However, the White House, according to a senior administration official, wants to make it more difficult for immigrants to be approved for asylum, citing rising approval rates. 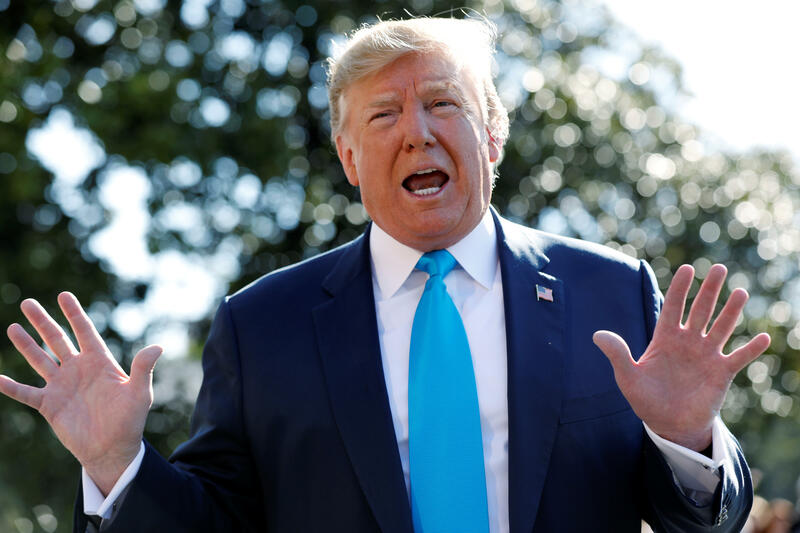 On Wednesday, the president praised Stephen Miller, the top Trump aide who, as CBS News' chief Washington correspondent Major Garrett has reported, is behind much of the president's renewed push for stricter immigration policies. Asked if he would consider making Miller his DHS secretary, since Miller is already, in the words of one reporter, essentially running his immigration apparatus, the president praised Miller but bristled at the idea that anyone aside from him runs immigration. "No, Stephen is an excellent guy," Mr. Trump said of Miller. "He's a wonderful person. People don't know him. He's a wonderful -- been with me from the beginning. He's a brilliant man. And, frankly, there's only one person that's running it. You know who that is? It's me." Mr. Trump also addressed his tax returns, which House Ways and Means Chairman Richard Neal has requested from the Treasury Department. The president claimed there "is no law whatsoever" requiring the treasury secretary to hand over Mr. Trump's tax returns, but there is a law allowing the head of the committee to review any individual's tax returns. The president's lawyer has made it clear he will fight the push for the president's tax returns in court. The president's attorney wants lawyers at the Justice Department to first review the request to hand over Mr. Trump's tax returns.